What is a Wedding Post Box? Do I need a gift card box? What is a wedding post box? Simple, an obvious and safe haven for all of your cards and gifts during your wedding reception or other celebration. But your gifts and cards are only safe if the post box is also secure and lockable. Unlike lesser cardboard or MDF flat pack versions which slot together our unique lockable round pillar box wedding post boxes come with a lockable removable roof cap. 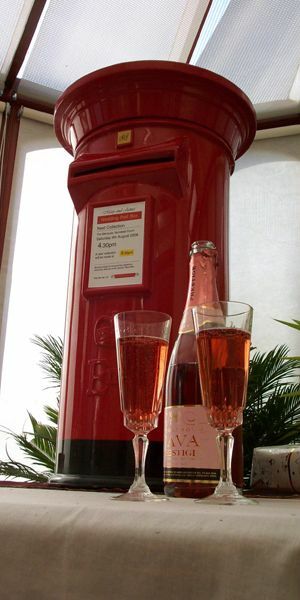 Our top of the range Royal Mail wedding post boxes have been designed from the ground up to resemble the iconic street side Royal Mail ER pillar box yet be a much more convenient size and not to be too obtrusive by dominating your wedding venue. And being our own lovingly created design and not a direct copy of any other type of post box you can rest assured that you are hiring the most desirable, unique and undoubtedly the best finished wedding card post boxes available. Don't just take our word for it, check our long list of testimonials from our wonderful and very kind happily married couples! And not only available in the iconic and traditional red but in a whole host of beautiful colours to compliment your own wedding colour scheme. Find more information about our excellent and affordable nationwide hire service here.